Once again we look forward to welcoming visitors to our sugarhouse for NH Maple Weekend. The “tours” we offer are in the sugarhouse and FREE! Brian goes over the maple production process from start to finish over and over all day long. So if you come in part way through just wait a bit and he’ll come back to the beginning. Questions are always welcome anytime. There are trees tapped close by to check out too, both in the yard and down a short path. (Boots encouraged for this.) And be sure to check out the Maple Leafs with Maple Trivia questions to test your maple knowledge. 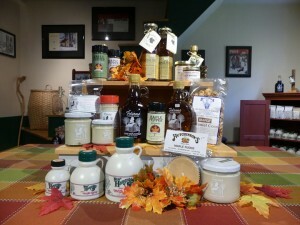 In the store we’ll have a variety of samples of maple products to taste and buy. And it would not be Maple Weekend without Maple Ice Cream Sundaes. Those will be on sale too ($2.00 ea) with your choice of maple walnut ice cream from Blake’s Creamery (made with real maple syrup) or vanilla ice cream for those who’d prefer that, topped with our own fresh maple syrup and real whipped cream. As always we’ll have a special table set up with some handouts for the adults and kids in the crowd as take-aways from your visit (while supplies last). PARKING: Crowds can be expected so please park only on the right hand, even numbered side (our side) of Candia Road or on Sheepwash Drive a short walk before you get to our place. No parking will be allowed on the hill beyond our driveway for safety reasons. The driveway and parking area are dirt and can be muddy so proper footwear is encouraged. We accept Visa, Master Card, Discover, American Express and Apple Pay. For your convenience we do have a Porta-potty on site. This season is another one to keep us guessing. The weather in February will go on record as the warmest February ever in NH. So let’s hope March brings some of the more seasonal winter back for us. 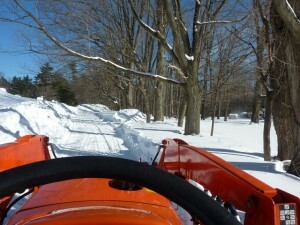 The snow is a good thing for us sugarmakers. It insulates the tree roots from warming up too soon and can help with radiational cooling so we get the right freezing temperatures at night to keep the sap running when it warms back up in the day. Maple Month starts up this coming weekend and we will have our “tours” in the sugarhouse as always. Brian does a great job explaining the whole process from sap to syrup and more. He also explains what equipment we use during each phase as we collect, boil and package our syrup. There is also a Maple Trivia quiz for you to try. Twelve Maple leafs hang on the wall, each asking a maple question. Answers are on the back for you to see how many you get right. There is lots of fresh syrup on hand to buy. We have Golden, Amber and Dark to sample along with maple cream and always another maple related product. It could be Maple BBQ Sauce, Maple Mustard, Maple Fudge or even Maple Popcorn. There is also Maple Pepper in 4 flavors: Original, Garlic, Rosemary and Habanero (our fav). There was plenty of sap on hand this week to boil so we have already made quite a bit of maple syrup. Today brought out a fair number of visitors to the sugarhouse. Lots of new faces too which is nice. A couple of folks even picked up the DIY maple kit to try out making their own syrup. Hope they have as much fun as we did. Tomorrow looks like the weather will be just miserable. Snow and sleet and maybe rain. Oh well. We’ll be open anyway. Once again we have signed up to be part of Maple Month with the NH Maple Producers Assn. But as always we will be open each weekend 12-4pm now through early April for visitors, offering tours and tastings of some maple sweets. Maple Weekend we’ll be open too with samples and tours. Hours will be 10-5 Sat & 10-4 Sun. But remember that’s the only weekend we do those to-die-for Maple Ice Cream Sundaes for just 2.00. Your choice of either vanilla ice cream or Blakes yummy maple walnut ice cream that they make with real maple syrup. Each sundae is topped with fresh maple syrup and whipped cream. Don’t miss it! Brian collected yesterday afternoon for the first time this year. He was off again at 7 am collecting today and will hopefully finish collecting by noon. We will be open from 12:30 to 4:30pm today and welcome anyone who wants to stop in for our first boil of the season. Obviously we won’t have syrup yet but we can all enjoy some sugaring talk and get our fill of the sweet maple steam rising off the evaporator. Opening up a field for tapping. We’ve worked hard to get lots of products ready for the shop. There are items for gift giving, yankee swaps, teacher appreciation, thank you gifts etc. Here’s a list of some items: Maple Syrup, Maple Cream, Maple Candy, Maple Sugar, Maple BBQ Sauce, Maple Mustard, Maple Caramel Popcorn, Maple Fudge, Maple Pepper and Pancake mixes.